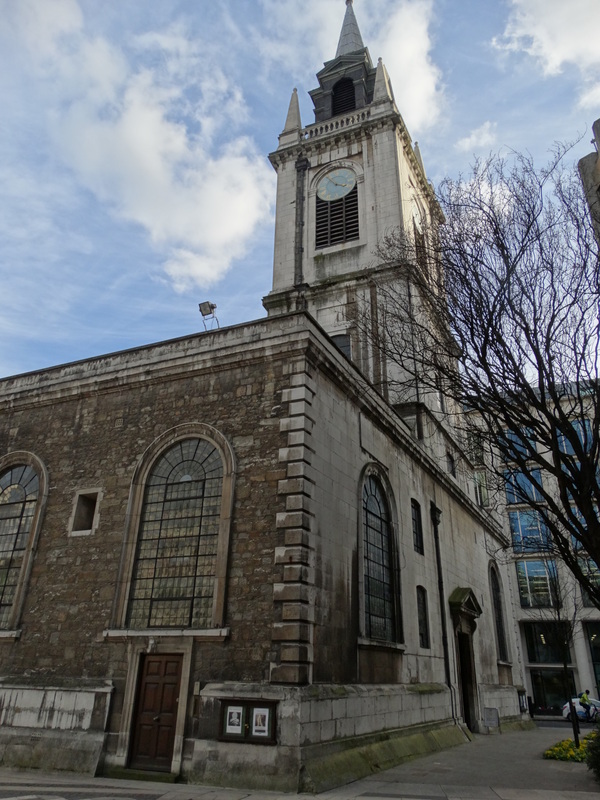 Just down the road is the church of St Lawrence Jewry – just beside the Guildhall. 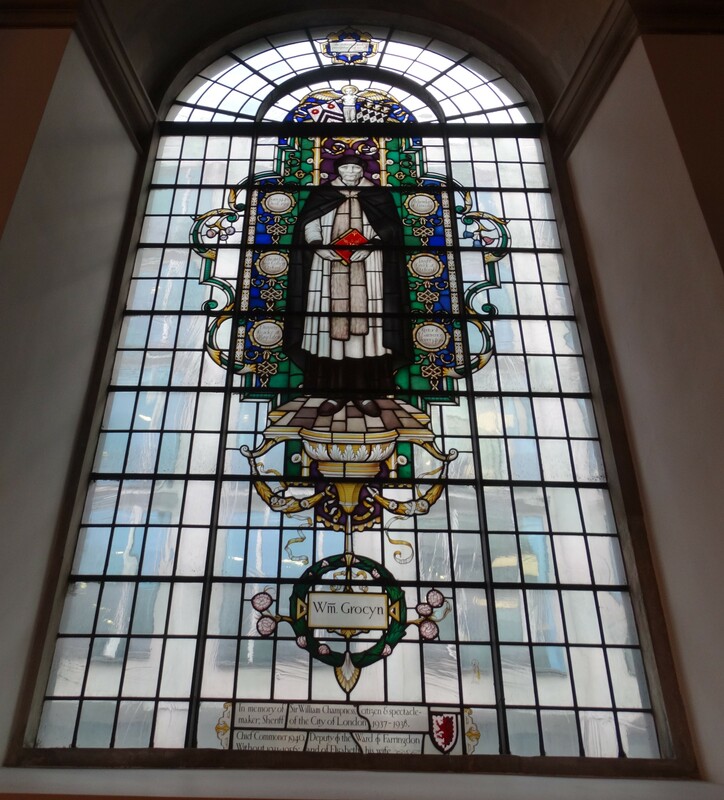 In my days in London – I worked as Librarian for the solicitors firm of Bischoff and Co from 1985-88 – I used to go here sometimes for a midweek service. 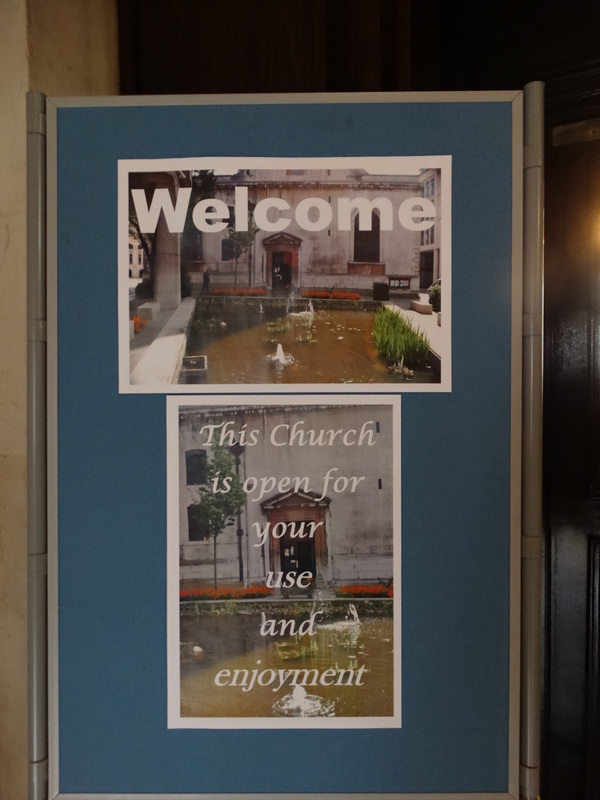 Their website doesn’t work as well as St Mary le Bow’s, but it has more Bible quotes. They have regular weekday services, welcoming notices, and a nice fishpond. The first church here was built on the western edge of the Jewish trading area. It was built in 1136. 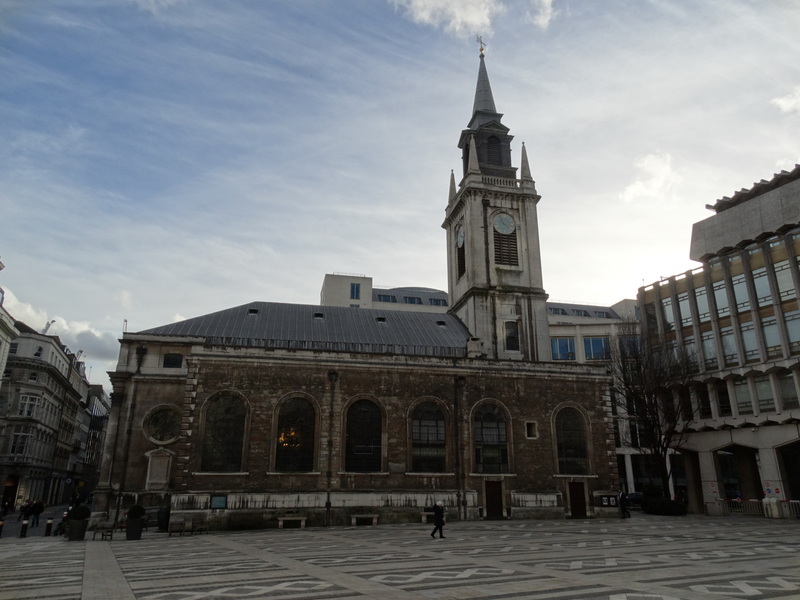 The Jews were expelled in 1290, and the church was destroyed in the Great Fire – apparently there were 156 churches in the City. They weren’t all rebuilt. 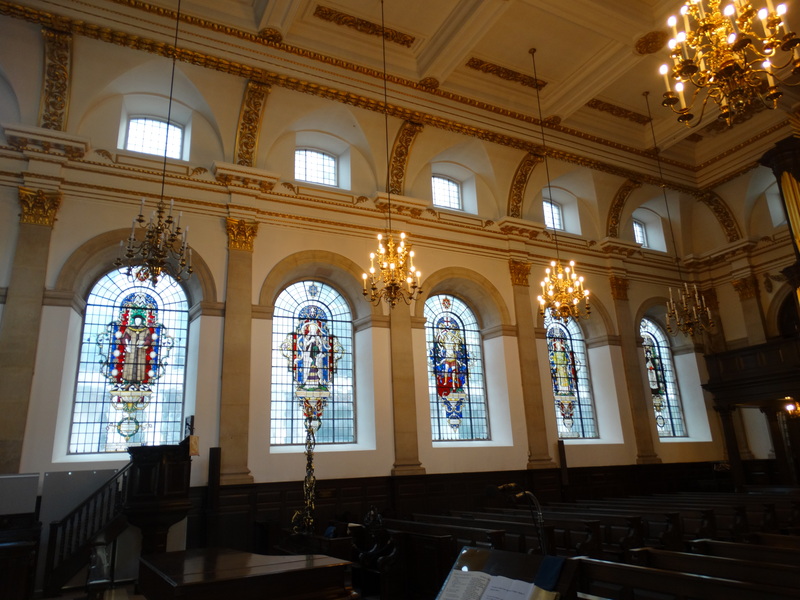 This was another Wren church, built in 1677. 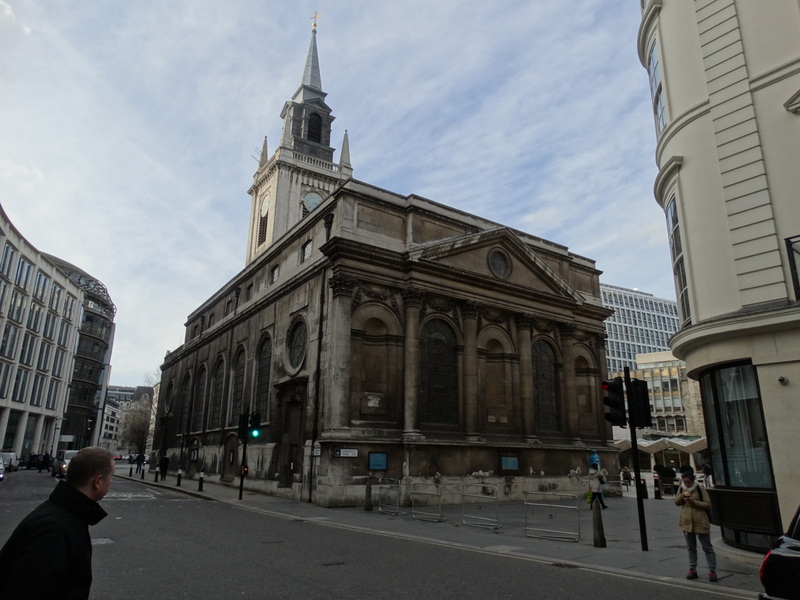 Their guidebook says it was his most expensive – though you read the same about St Mary-le-Bow! 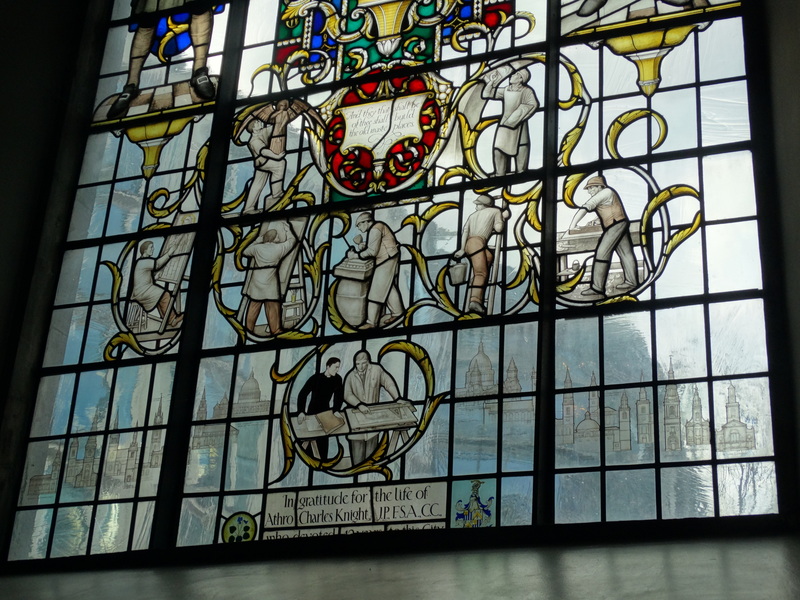 It was damaged in the blitz of 29 December 1940. 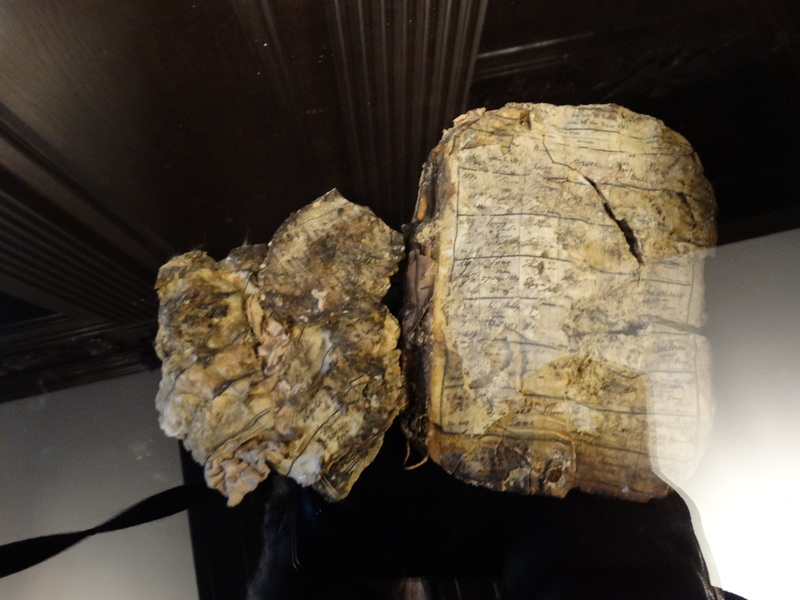 The baptism register, being made of vellum, shrunk rather than burnt. The architect for the rebuilding was Cecil Brown. 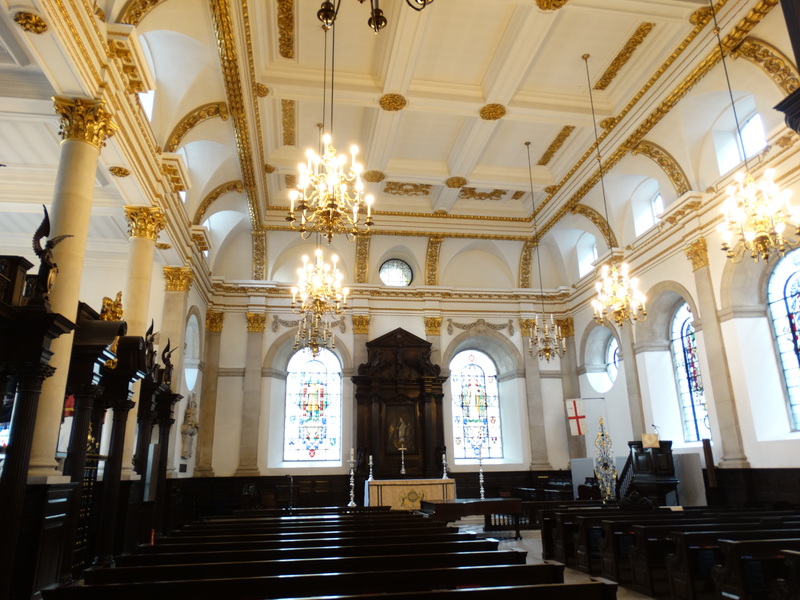 The magnificent ceiling is a recreation of Wren’s original – the building is beautiful and full of light. I started in the Commonwealth Chapel. A carved oak screen, with a wrought-iron screen made by the Royal Marines. 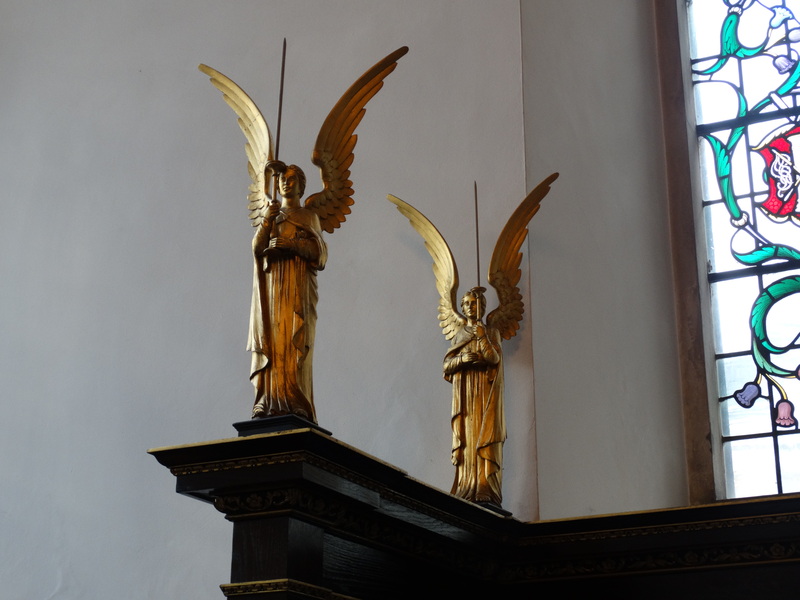 I liked the angels on the screen and the angels above the altar. 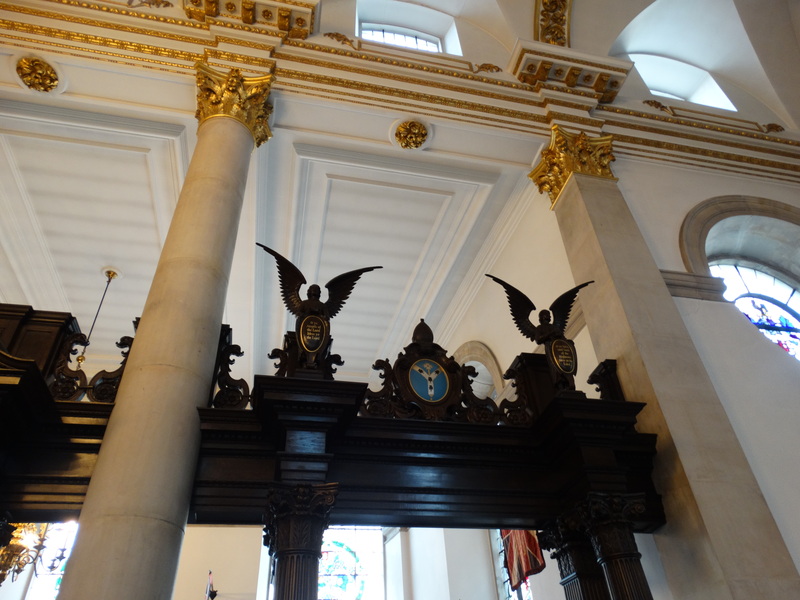 It was in this side chapel we used to have our midweek services. 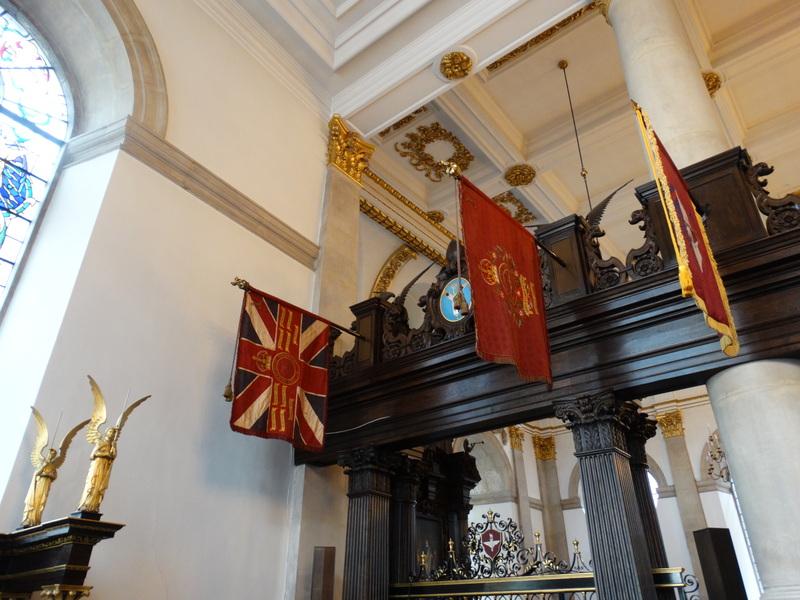 Nice selection of flags. 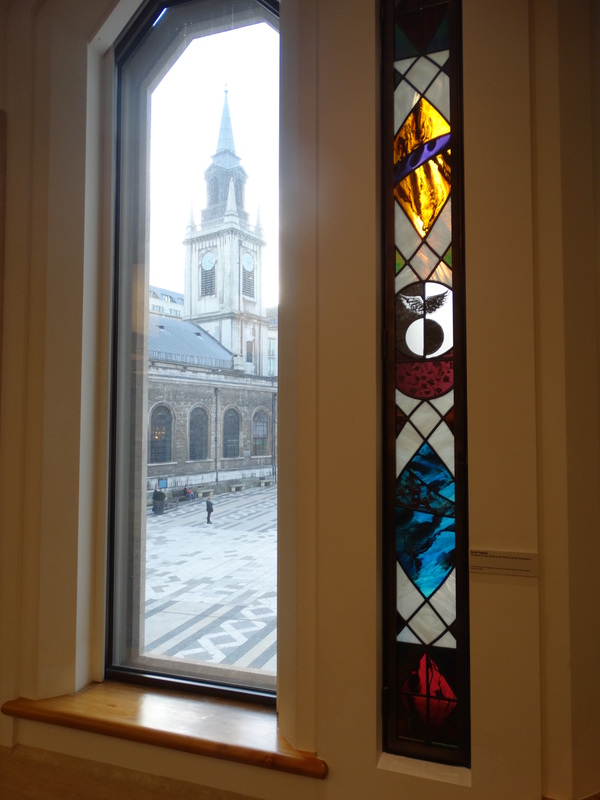 The windows are lovely too. They are all by Christopher Rahere Webb, born 1866. At the time of his birth his father was working on the church in Smithfield, founded by a Rahere. He was educated at Rugby and the Slade, and he worked within the same method and technique of the C15. 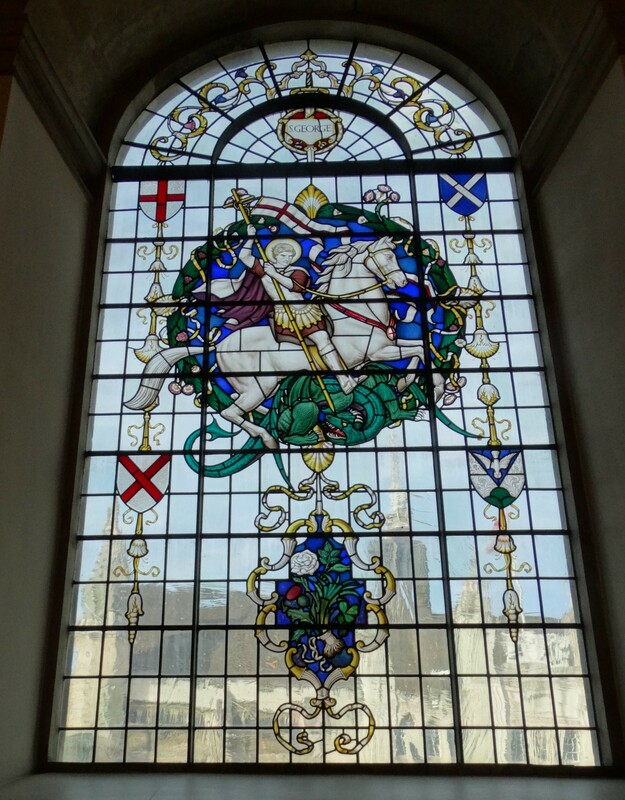 This is the St George Window in the Commonwealth Chapel – note the leek, thistle, shamrock and rose underneath. 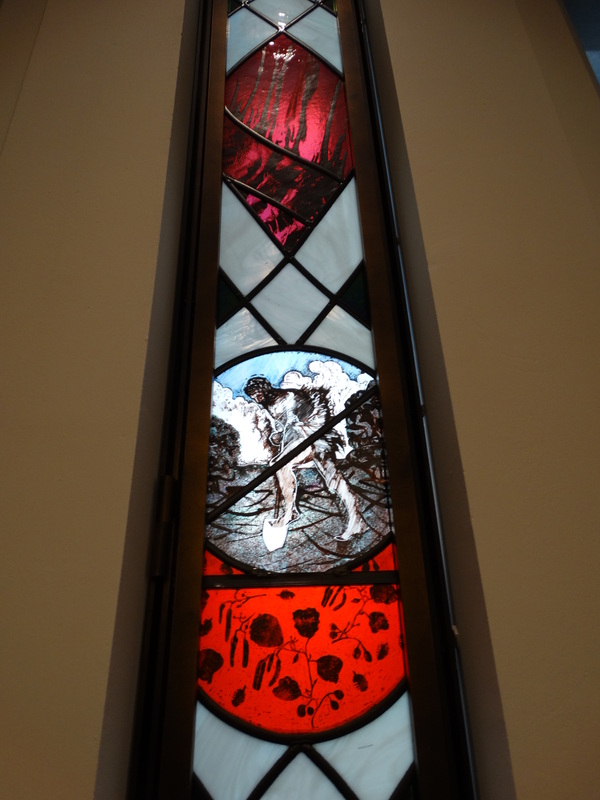 In the main body of the church is St Michael (in 1892 the parish of St Michael Bassishaw was amalgamated with this one). 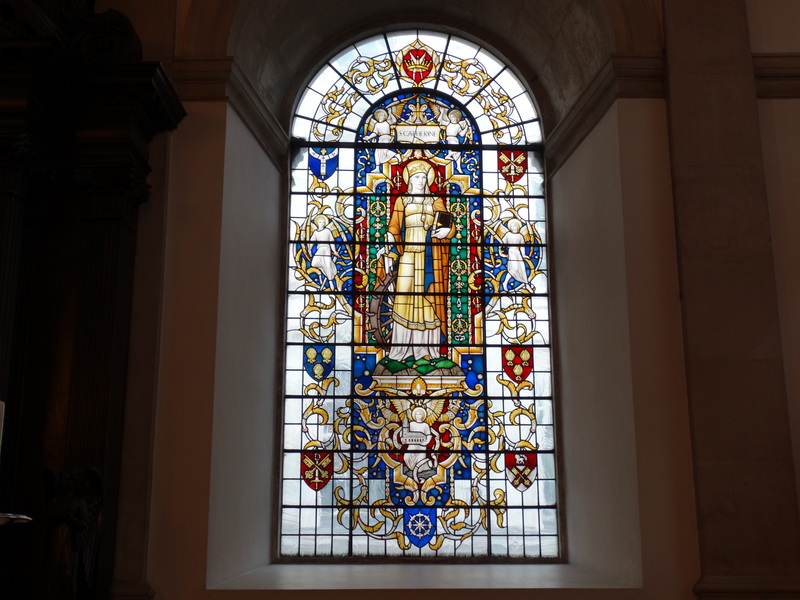 We also have St Catherine – in the east wall of the church. 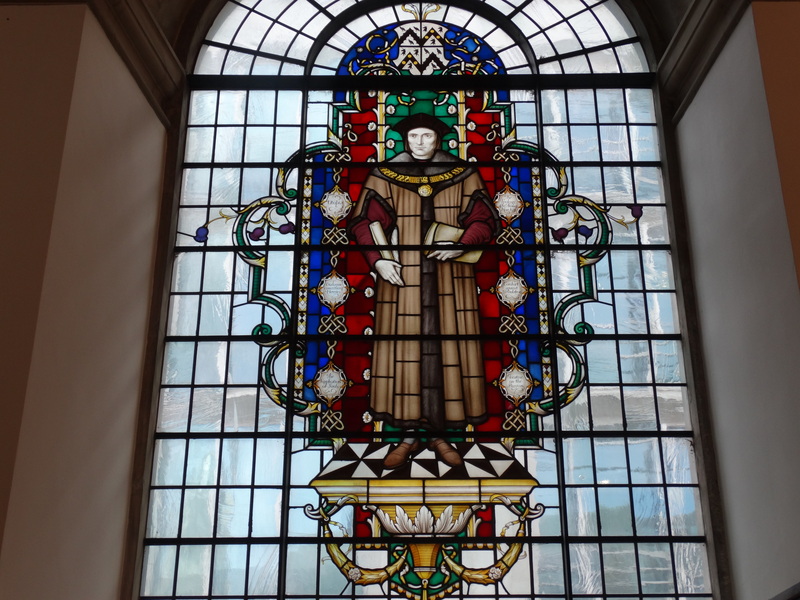 These gentleman are William Grocyn (1446-1519) and Thomas More. Gorcyn was one of the foremost scholars of his day and a tutor to Thomas More. 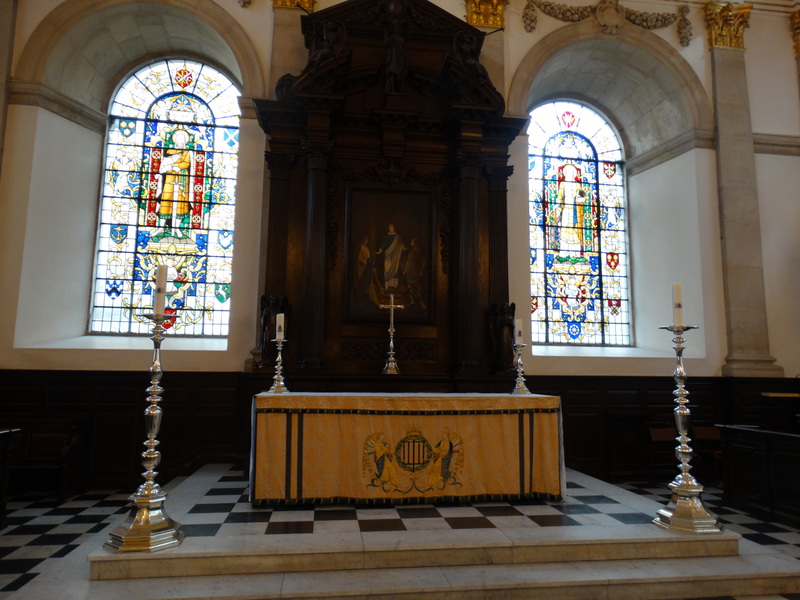 He was Vicar here from 1496 to 1517. Erasmus described him as “the patron and preceptor of us all”. 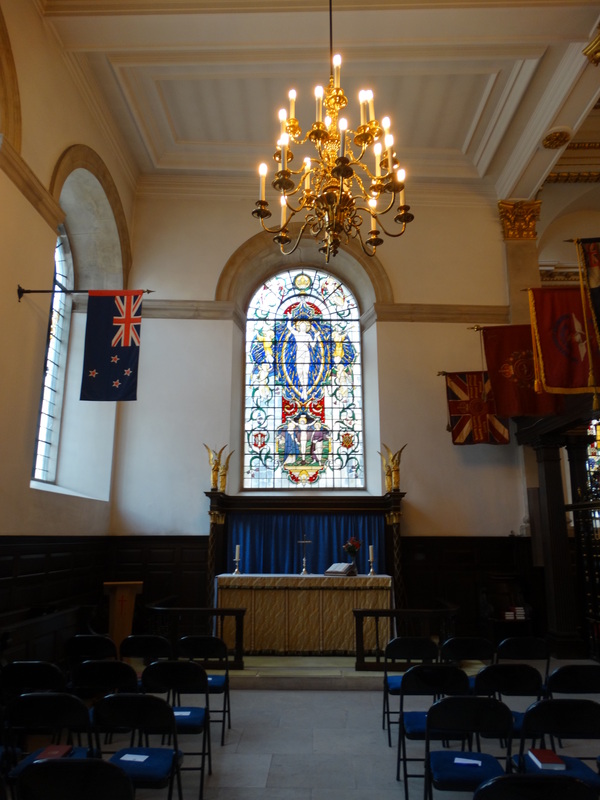 More was born in Milk Street in 1478, just a few yards from the church. 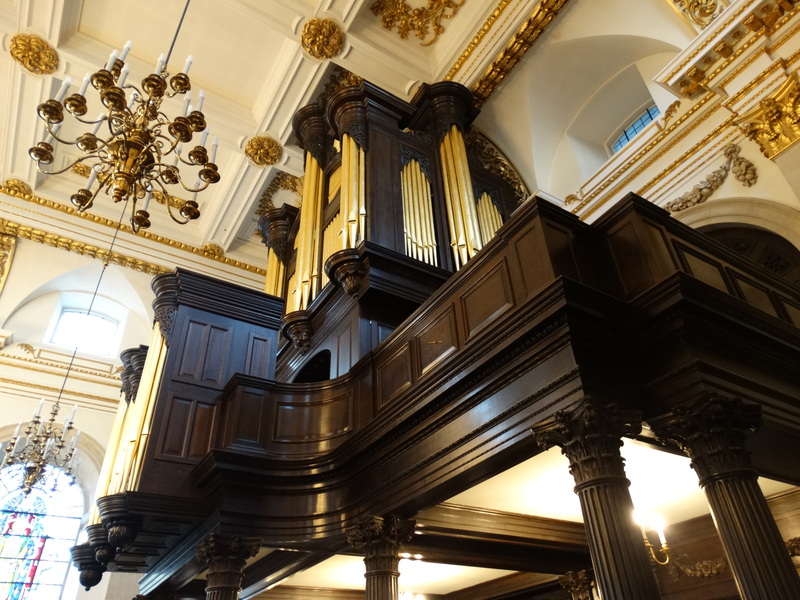 The organ was installed in 2000-1 by Klais of Bonn – it would be nice to hear it sometime. 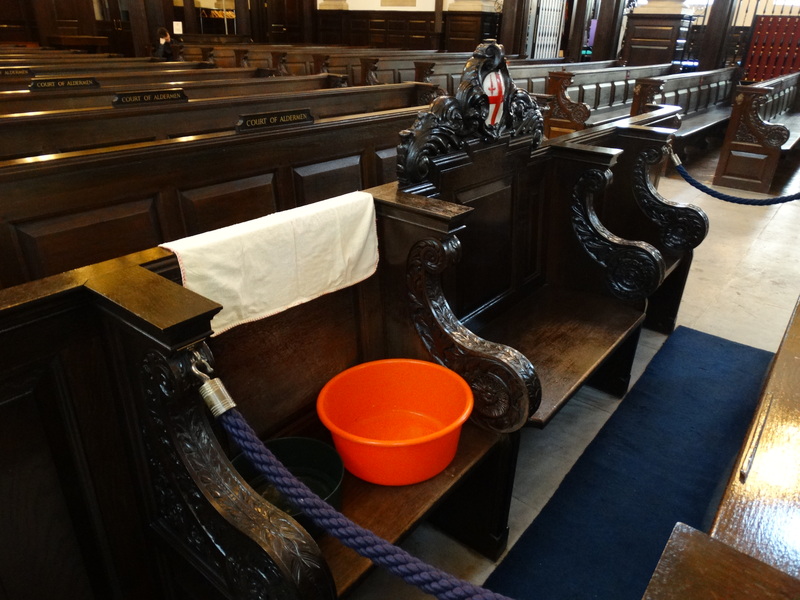 It was paid for by City Livery Companies – the fact that there is an orange bowl and several other buckets nearby, suggest that Livery money is needed again. 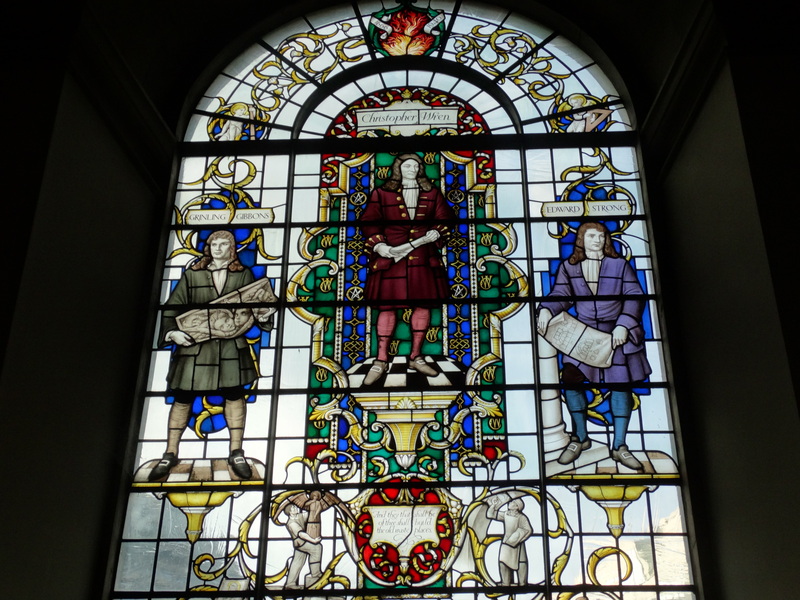 The Christopher Wren window is in the vestibule – I love the figures working in the bottom. 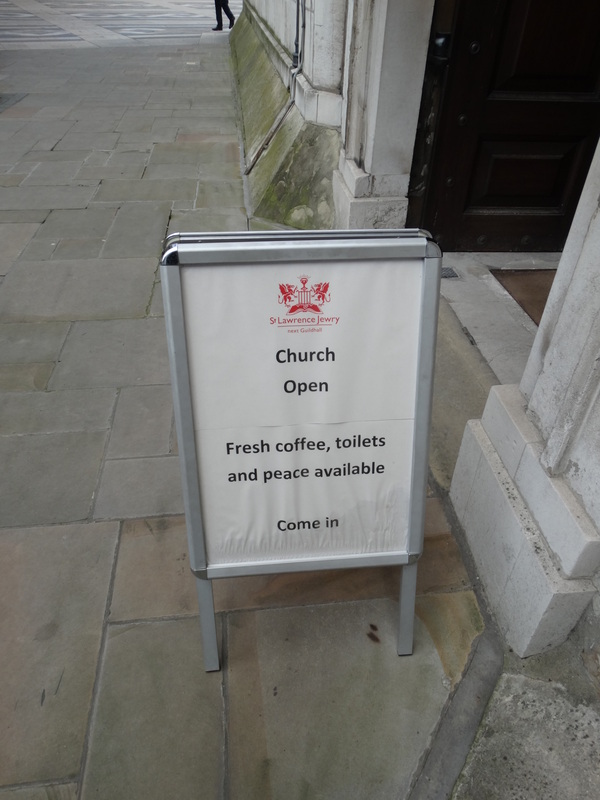 They had a flask and the offer to make coffee – lovely that people want to drop in and enjoy. I hope the City appreciates its churches. 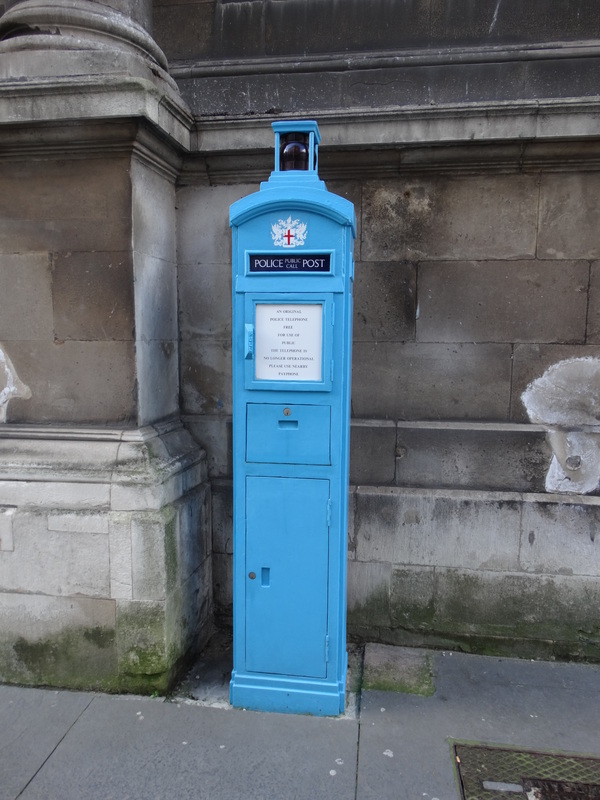 Outside at the east end is a Grade II listed police public call box, circa 1935. It deserved a photo too. 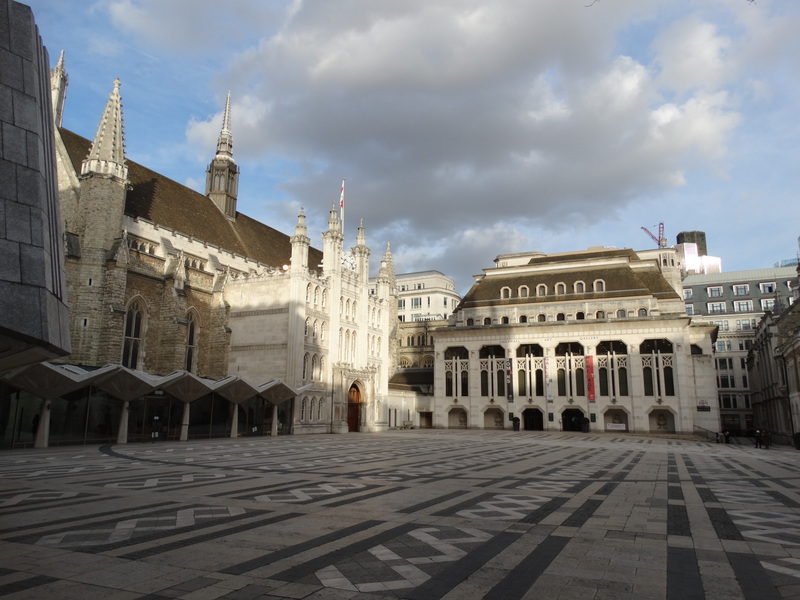 Just across the Square is the Guildhall and the Guildhall Art Gallery – website – a place I had never been. The art is lovely, the Roman amphitheatre fascinating, and it is free. Highly recommended. 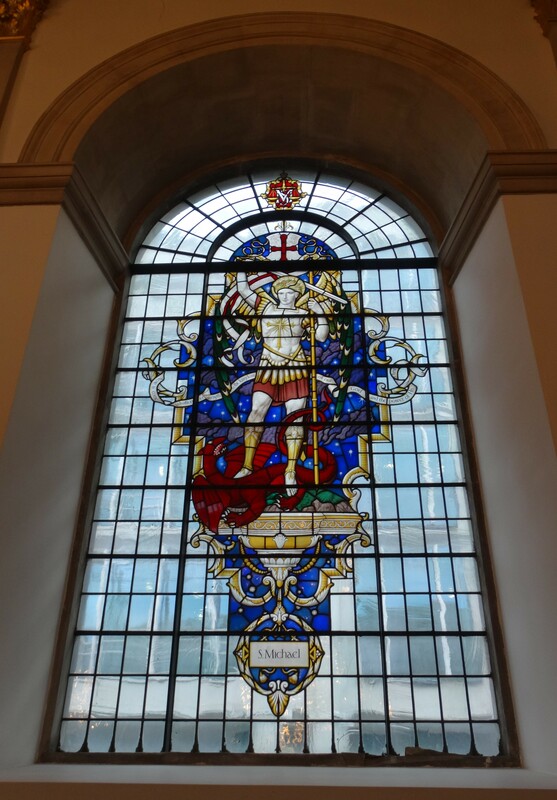 There is some modern stained glass by Stella Timmins, and a view of St Lawrence Jewry.